The port is part of the centre's project to develop inland waterways and the stretch of Ganga between Varanasi and Haldia for navigation of large vessels. 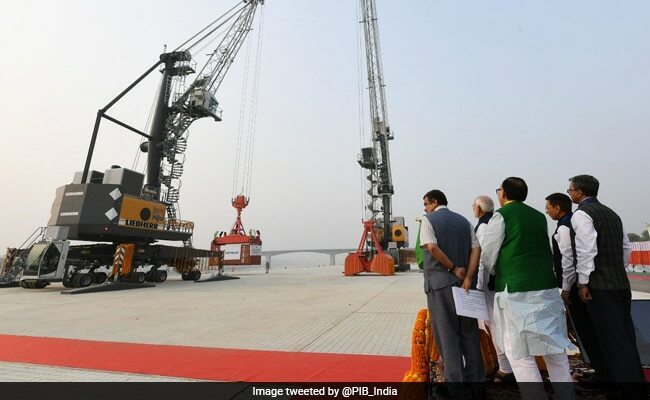 Prime Minister Narendra Modi on Monday inaugurated an inland port in Varanasi on the Ganga River as part of the centre's push to develop inland waterways, starting with the stretch of the river between the Uttar Pradesh holy city and Haldia in West Bengal for navigation of large vessels. The project was unveiled as the PM, along with Union Transport Minister Nitin Gadkari, received India's first container vessel that sailed from Kolkata on the inland waterway on October 30, carrying cargo belonging to food and beverage giant PepsiCo India. This is the first of the four multi-modal terminals being constructed on the River Ganga dubbed the National Waterway-1 as part of the World Bank-aided Jal Marg Vikas project of the Inland Waterways Authority of India. "This is a historic day for Varanasi and India. For the first time since Independence, we are using our extensive river network for commerce at this scale. It should have happened decades ago but we have finally made it happen now," PM Modi said, speaking at the launch. According to an official statement, the Centre's Jal Marg Vikas Project aims at developing the stretch of the river between Varanasi and Haldia for navigation of large vessels weighing up to 1,500 tonnes to 2,000 tonnes. It aims to promote inland waterways as a cheap and environment-friendly means of transportation, especially for cargo movement. The Prime Minister will also inaugurate two national highways and various projects related to the cleaning of the Ganga in Varanasi.